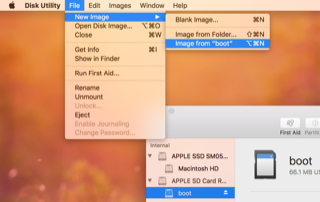 Backing up your Raspberry Pi SD card on Mac. The simple way. It’s very easy to burn an SD card by writing to it too many times. Or irreversibly fuckup your configuration by doing what sudoer should not do. Cloning your SD card, as an image that you can flash on a new card when you need it, is the perfect backup strategy. Update 1: Some readers reported that this tutorial does not always work with the Raspberry Pi model 3B. I’ve not been able to personally test, so please be aware. Update 2: This tutorial just backup the boot partition, not the entire SD card. If you want to backup the entire SD card, you have to do some extra steps via command line. Here a complete guide. Insert the SD card inside your mac. 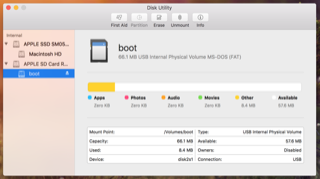 Open Disk Utility app and select the partition you want to backup inside the Raspberry Pi SD card. Then select File > New Image > Image from “boot”. Select DVD/CD master from the Format menu, then Save. This will create a cdr file, which is the mac version of the iso file. Done! You’ve created a complete clone/backup of your RPi SD card. Sometimes in the future you will have to eventually restore this backup. How to do that? Simple, restore the the backup file with with your favourite app. On MacOS I suggest you to use the Etcher app. Before opening Etcher, you need to rename the file, replacing the .cdr extension with .iso extension. To get my latest Swift misadventures subscribe to the publication. Cheers. Vi gemmer al den hygge væk, som flyder her til daglig og sørger for at alt er tomt og vinkelret og saglig. Her ligner et sterilt og ubeboeligt kontor for der kommer et par mennesker, som skal se, hvordan vi bor.